There's been so much excitement and speculation around the new BMW Z4 Roadster that it seemed like this day would never arrive, now we finally get a proper look. As we all know by now, the BMW Z4 Roadster – and its Japanese cousin, the Toyota Supra – is all new from the ground up. Literally, everything is new. And when two giants of the motoring industry join forces, we think it's going to be excellent. That's not to say the two cars are the same, as is the case with the Toyota 86 and Subaru BRZ. Nope, the new Supra and Z4 may share many parts but were developed completely separately, with very little collaboration between the engineers once the parts bin had been decided on. So we can expect two very different cars. So, on to the vehicle itself. The Z4 is wider, longer and higher than the outgoing model, although the wheelbase has been shortened, which should mean better agility and sporty feedback. In terms of design, which is always subjective, we feel the BMW has finally shrugged off what many felt was a slightly feminine feel, with a stronger, more purposeful stance and aggressive lines. Which is a good thing considering its biggest rival is likely to be the perennial favourite in this niche, the Porsche Boxster. Under the hood are two options for buyers to choose from. First up is a 2.0 litre turbocharged inline four which makes 255hp and 295 lb-ft of torque for the 30i model, while a 3.0 litre turbocharged inline four will pump 382 horsepower and 369 lb-ft torques in the M40i. Both will be mated to a ZF eight-speed automatic transmission. Offered as optional extras on the 30i, the M40i comes standard with performance equipment including adaptive dampers, M Sport brakes, and an electronically controlled limited-slip differential. Both models ride on 255/18" front and 275/18" rear tyres with 19 inchers optional. Inside, BMW has included their new Z4 sports a new digital cluster with a variety of customisable displays and a new central infotainment screen, called Live Cockpit Professional – driven by the familiar iDrive – takes centre stage. Overall, we think the Z4 Roadster is a winner, and perfect for the South African climate. The German manufacturer, we're sure, is hoping it's a winner too. 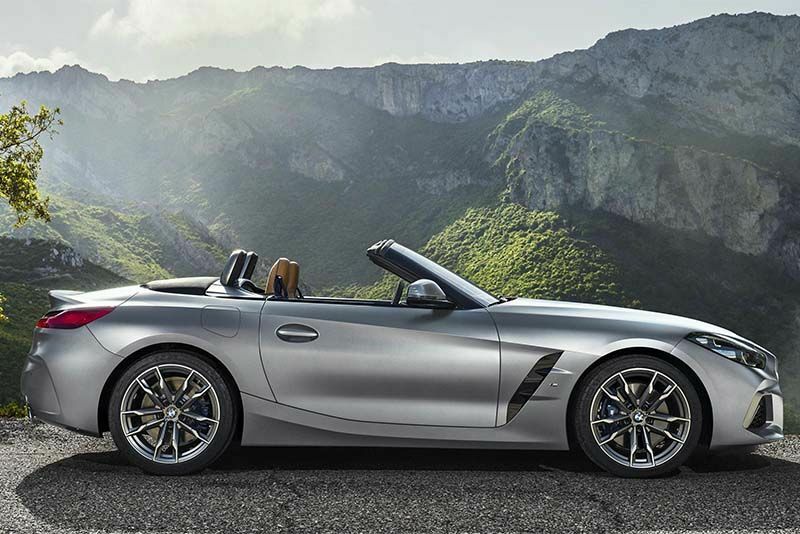 Want to know more about the BMW Z4 Roadster? Simply click play below and see what the guys at Auto Express had to say when they got a peek at it.